Hostiso assures 99.99% uptime on its website. This hosting provider utilizes advanced facilities at its data centers to provide reliable hosting services at all times. How Much Does Hostiso Cost? Hostiso uses cPanel/WHM control panels. cPanel is a popular hosting control panel that gives you full control over your hosting account with no technical skills needed. You can easily set up emails, check stats, and do much more. Each enterprise has its own characteristics, and may need a particular type of solution that will be designed for their business size, type of clients and staff and even individual niche they cater to. We advise you don't count on locating an ideal service that will be suitable for each company regardless of their history is. It may be a good idea to read a few Hostiso reviews first and even then you should keep in mind what the hosting service is intended to do for your company and your workers. Do you require a simple and straightforward hosting with only essential functions? Will you really make use of the advanced functionalities required by experts and large enterprises? Are there any specific features that are especially practical for the industry you operate in? If you ask yourself these questions it is going to be much easier to find a reliable service that will fit your budget. We realize that when you make a decision to buy Hosting Services it’s important not only to see how experts evaluate it in their reviews, but also to find out if the real people and companies that buy it are actually satisfied with the product. That’s why we’ve created our behavior-based Customer Satisfaction Algorithm™ that gathers customer reviews, comments and Hostiso reviews across a wide range of social media sites. The data is then presented in an easy to digest form showing how many people had positive and negative experience with Hostiso. With that information at hand you should be equipped to make an informed buying decision that you won’t regret. What are Hostiso pricing details? Yes, Hostiso is a great platform for WordPress blogs and sites. Yes, Hostiso offers a free domain with their hosting plans. Yes, Hostiso offers both Windows and Linux hosting services. Yes, Hostiso offers unlimited email addresses and unmetered bandwidth with its packages. Yes, Hostiso is a great choice for eCommerce stores. They provide unlimited amount of free SSL for life to help online stores. Hostiso offers the use of cPanel/WHM control panels. Do they allow you to quickly set up a website with no HTML or coding skills? Yes, Hostiso offers a powerful website builder to help novices. Hostiso accepts credit/debit cards, PayPal, Skrill, Stripe (credit card), Aliypay, and Bitcoin. Hostiso guarantees 99.99% uptime on its website. In case of downtime, they are willing to pay a credit as reimbursement. Hostiso utilizes state-of-the-art facilities in its highly secure data centers to provide reliable hosting services at all times. Hostiso is a very good place, if you want total freedom and multiple independent sites for a price of one. If you stay with them for a bit, they will flood you with even better prices (I’m in for the next 5 years). Their support is very good , very helpful. They don’t just send you a sample email, but try and solve your individual problems. They don’t try to constantly sell you stuff either. They have a good domain, SSL service (They set up free SSL for you (which is, if you’re not a professional, would be hard), and don’t charge for it again. But they leave you the freedom, if you are able to, you can set it up for yourself). Fantastic host. Very prompt and thorough. I can’t imagine being happier with a hosting service. I feel their prices are a little on the high side compared to what bandwidth you get. It is truly a top class outfit, and I cannot say enough good things about the quality of their hosting and their support. I got the Hostiso treatment and I’m never looking back! 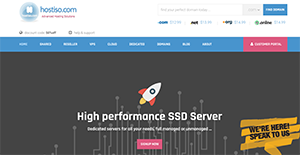 Top web host for running any sites. The pricing of the plans could not be any lower without being free! I’ve had a couple problems so far and their customer service has sorted it out and made it all right by me! They are very quick to respond and good at their jobs. I have several sites with Hostiso and I have not had any problems. Support is genius, very fast and helpful. There was no a single problem during this period of time. My last host was always causing problems to my website by limiting it thereby trying to get me on a more expensive hosting package. With Hostiso, I feel very comfortable. It is definitely the best hosting company in the world! Pros: Support, replay time, price, software, security etc.